Family Legacy is so thankful to the Kirkpatrick family for sharing their story of a wonderful caregiver from Adoration Hospice. 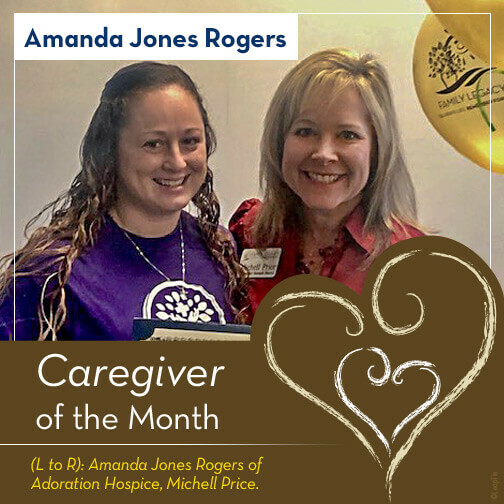 Congratulations Amanda Jones Rogers for making a difference in the lives of so many and being recognized as our Caregiver of the Month! Amanda was Richard Kirkpatrick’s hospice nurse for a very short time, but within that time she gave exceptionally tender and loving care to him. Any time she was called with questions/concerns from family members, she was helpful and consoling. On the day of death, she was called to come to attend to him. She took careful attention to his vital signs and physical health as far as appearances and struggles. After two hours, she gave the family her clinical findings. We were very thankful for her truthful expertise and she was right on correct.